Early in 2013, Arturo Garcia lay in a room at University of Colorado Hospital. A few weeks before, Garcia, then 38, had undergone surgery to remove a malignant tumor near his pancreas. Now he was battling what he described as a “nasty infection.” Weeks of grueling chemotherapy lay ahead – if he could survive the infection. Drains protruded from his body. But that wasn’t the worst part. Garcia sat on his bed, his eyes closed. When he opened them, he saw…nothing. 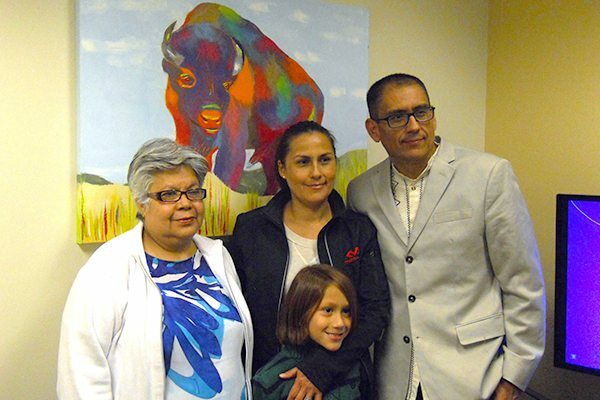 Arturo Garcia (far right) and his family with one of the paintings he donated to the Cancer Center during a reception May 26. Left to right: Garcia’s mother, Maria Torres; wife Erika Tejeda; son Arturito. “There was no floor,” he recalled, “only a huge abyss.” He drew up his legs and called for his wife, who had spent every night with him in the hospital, sleeping in a chair, sometimes using the wall as a pillow. “What’s going on, Mama?” Garcia asked his wife. It’s only a bad dream, she told him. But in one important way, it wasn’t. The abyss, Garcia realized, had presented a message that was terrifyingly real. “I thought about how meaningless my life had been,” Garcia said. He recounted the experience on a warm afternoon in early June. Thin but healthy and brightly engaged, he spoke with a visitor near an alleyway behind one of the galleries on Santa Fe Drive in Denver that displays his artwork – vividly colored paintings of famous figures, animals and landscapes. He sat astride a folding chair, his feet planted firmly on the ground. After his brush with darkness in the hospital, Garcia said, he made a decision – one that saved his life just as surely as his surgery and chemotherapy. Garcia recovered from the infection, completed his cancer treatment and is now free of the disease. In appreciation for the lifesaving care he received from UCH and the University of Colorado Cancer Center, Garcia recently donated a pair of his paintings. The Cancer Center unveiled the paintings, now hanging in a conference room, during a reception May 26. One can appreciate Garcia’s art for its own sake, but on a deeper level it represents a much larger body of work: his life, defined by purpose. Garcia’s drive for meaning was integral to his recovery, said Colin Weekes, MD, PhD, Garcia’s medical oncologist and a specialist in pancreatic cancer. 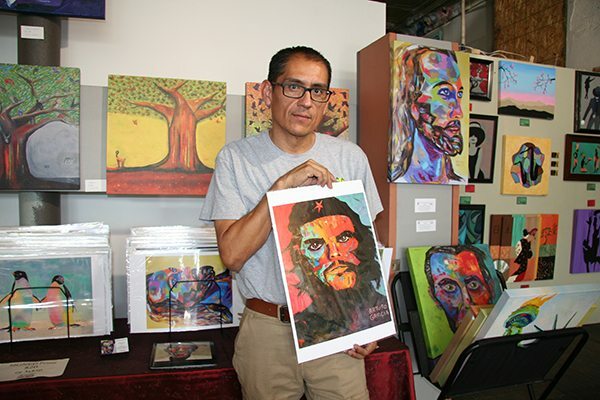 Garcia shows a print of a painting of Che Guevara that he completed at the start of his recovery from cancer. Just before his cancer diagnosis, Garcia was on a path that seemed to hold few prospects for new beginnings. He was a bartender at 3 Margaritas restaurant in Lakewood, a job he described as “a no-brainer.” He had left Mexico in 2008 following a divorce from his first wife and a recession that derailed his work selling real estate at Lake Chapala in Mexico, a popular community for U.S. and Canadian retirees. Neither of the jobs had provided much “fulfillment for the soul,” Garcia said. On a Saturday night in December 2012, Garcia was less concerned with seeking fulfillment than with fighting abdominal pain that he said nearly paralyzed him. It was a busy night and at his boss’s request, Garcia battled through physical agony for another hour before going home, showering and then getting himself to the Emergency Department at UCH – he doesn’t remember how. He was admitted with a raging fever and was later diagnosed with an enlarged pancreas. An endoscopy procedure and pathology test showed he had a malignant tumor in the ampulla of Vatar, a small opening into the duodenum, the top part of the small intestine. The tumor, about the size of a grape, prevented Garcia’s pancreatic and bile ducts from emptying their secretions through the ampulla of Vatar into the intestine, said Barish Edil, MD, associate professor of surgery and director of the Pancreas and Biliary Surgery Program at UCH. Ampullary cancer, which is rare, can be deadly, but in at least one respect, Garcia was lucky: his had not metastasized, Edil said. Garcia needed a surgical procedure known as the Whipple. It’s essentially a gastrointestinal replumbing that involves removing the tumor along with the head of the pancreas, the duodenum and the gallbladder, then sewing the bile duct into what remains of the intestine to allow it to empty its secretions. Edil, who arrived at UCH from Johns Hopkins in 2011, is an expert in the procedure. 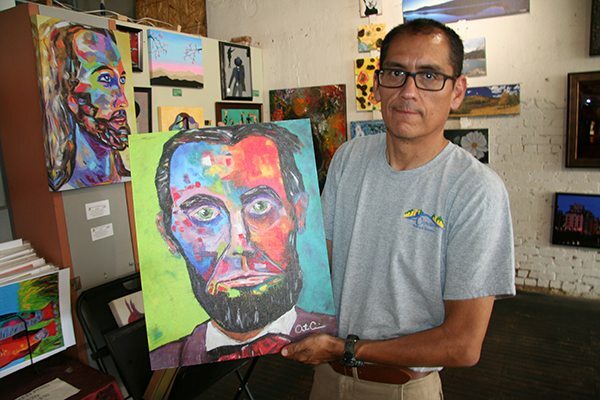 Garcia’s interpretation of Abraham Lincoln reflects his return to the vivid colors of his early life. Edil called Garcia’s prognosis very good, but added that skillfully delivered clinical care does not alone guarantee a successful recovery. Following the surgery, Garcia was tested by the infection fight and the challenges of 12 rounds of chemotherapy. The experience, he said, opened doors for him in unexpected ways. After coming home from the hospital the second time, he got his art supplies out, but struggled to paint still-lifes and landscapes realistically. With time, he found that the past found its way into his work. Increasingly, the colors in his paintings harkened to those used by the Huichol Indians of Mexico who are indigenous to the area of Mexico where Lake Chapala sits. Garcia recalled as a boy seeing the colors – ultramarines, violets and magentas – in caves and on a small island in the lake. Images of deer, sun and water, sacred elements for the Huichols, also crept into his paintings and his consciousness. “Something shifted inside and I began to look at life differently,” Garcia said. “It was a psychic change – a change in my soul.” He began using meditation as a form of self-healing and painted with commitment and determination. He completed two portraits in the new style, one of Abraham Lincoln and another of Che Guevara, then a flood of new work. 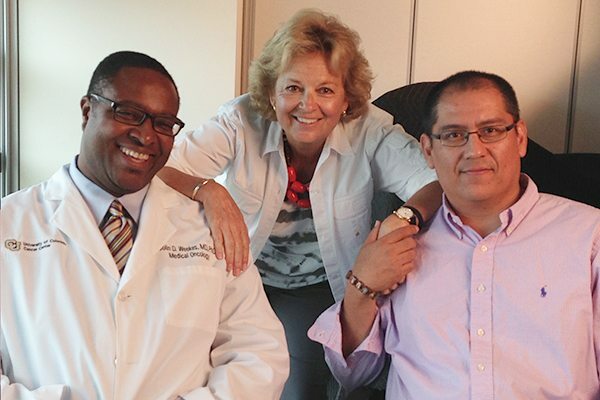 University of Colorado Cancer Center medical oncologist Colin Weekes, left, and Maureen Shul of Wings of Hope have played important roles in Garcia’s new life. Cancer opened other doors in unexpected ways. In 2012, Maureen Shul had formed Wings of Hope after pancreatic cancer took the lives of her brother and mother only months apart. Shul, a former mayor of Castle Pines and a business owner, had little experience with not-for-profits, but created Wings of Hope to raise money for pancreatic cancer research and to increase awareness of the disease. Well before they met, Shul’s motivations hewed closely to Garcia’s. One of them turned out to be Weekes, whom she met through a mutual friend at a Pancreas Cancer Action Network meeting. 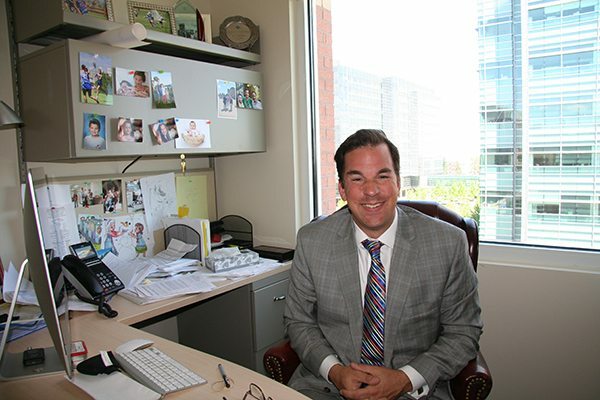 After building a close relationship with Weekes and many of his colleagues, including physicians Richard Schulick, Tom Purcell and Wells Messersmith, Shul forged a formal partnership with the CU Cancer Center in 2013. Wings of Hope has since raised and donated more than $400,000 for research into the disease, and Weekes serves on its board of directors. Shul eventually connected with Garcia at a Wings of Hope event, and the two formed a strong bond and friendship. He’s a highly valued regular at the organization’s fundraisers and a source of inspiration for others facing deadly disease, Shul said. “When a patient goes through what Arturo has gone through, there is a state of grief, hopelessness and confusion,” she said. The challenge for many patients, Shul added, is finding a way forward from “grieving the old way of life” and finding new purpose. She recalled him meeting at her request with a woman recently diagnosed with pancreatic cancer who was afraid of treatment. “It was something to behold to see him share his experience and give her hope and a basis to fight,” Shul said. Weekes and his colleagues share a similar commitment to meeting patients on their own terms and helping them face their disease with “an innate empathy and compassion,” Shul said. Barish Edil, MD, performed a lifesaving Whipple procedure on Garcia in 2012. It can be no other way with a disease like pancreatic cancer, which continues to exact an enormous toll in life and suffering, Weekes said. One-year survival rates are only about 20 percent, while five-year rates remain in single digits. Arturo Garcia is acutely aware that he received a rare opportunity to begin life anew. He’s not going to waste it. He vows to continue using his paintbrush to complete the grand work that is his life. —Tyler Smith. Smith is a writer and editor for the UCHealth Insider. To comment on this article, contact him at tyler.smith@uchealth.org.